neckattack® searches trained Pysiotherapeuten (m / w) and massage therapists for jobs throughout Germany (m / f) who are mobile and can be flexibly divided for business contracts. You expect a varied, attractive Paid activities at small, medium and large enterprises. We are looking for regular massage promoters to work in the trendy bars and lounges. You should be young at heart and young, outgoing and personable and already have experience in the sampling. You love to people, like going into bars and lounges and are ready once or several times at night to work per week for 4 to 5 hours? In the neckattack® massage training you will learn the basics of modern compact spa massage on the massage chair . The seminars for Mobile Massage is the first day of practice focusing on, at the same time important issues of the theory will be taught, and in the seminar Manual shown again in detail. 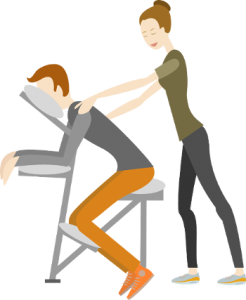 On the second day we practice intensively the classic chair massage, and rehearsed the entire 20-minute sequence of neckattack® massage.